One thing I learned from the Winnipeg Free Press article by David Sanderson is that Winnipeggers are passionate about their burgers! 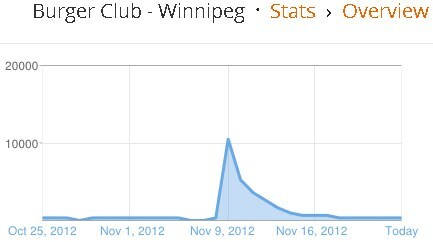 The piece on Burger Club – Winnipeg received 200 comments and was trending as the most viewed article on the WFP for several days. It didn't hurt that the mugshot of Scott and me was on the WFP’s landing page for over a week, and our picture took up half of page one in the printed Detour section. 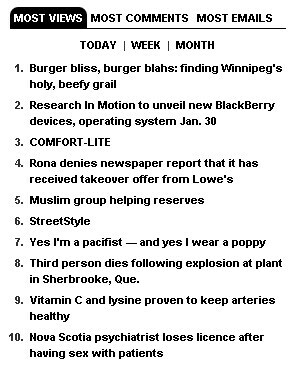 Apparently writing about burgers is an industry in Winnipeg and there have already been a couple of spin-off articles in the Sou’Wester and RestaurantCentral.ca about the article about the blog. The blog received over 26,000 hits as a result - 13,000 in the first 24 hours of the article coming out. I can now say I've had my 15 minutes of fame. People I don't know pointed at me and shouted “Burger guy!” My real moment came at the Kings Head though. I arrived to a packed lunch hour crowd and there wasn't a seat to be had except … for the reservation I’d apparently made and forgotten about. The always entertaining wait staff were serving a lot of burgers and Jay Khanuja was at the bar chatting to some people that had come because of the article. Jay tells me he plans on adding more stuffed burgers to the summer menu so I’m looking forward to that! David and I exchanged information via e-mail and I knew right away we shared a love for burgers and I quite enjoyed his wit and wordsmithing. We needed to get together for the official picture by the Free Press photographer and that’s when the comedy really started. We met at Original Georges, and when I arrived David and photographer-Joe were already waiting in a booth in an empty section in the back of the restaurant. There were two Fat Boy platters on the table but I wasn't allowed to devour mine until Joe took his picture. Apparently Joe had some sort of a vision that involved Scott and I linking arms and feeding each other our burgers. Neither one of us are gymnasts and while we were busy trying to get entangled for the shot the waitress came around the corner and barely raised an eyebrow before saying “Excuse me for interrupting, but …” We were laughing, and Scott’s burger was dripping on my arm and running onto my knee where a large puddle of chili sauce and grease was forming while Joe took about a hundred pictures. Anyone who reads online news media articles knows about all the wacky comments anonymous readers leave. I've never been called an idiot by so many people. “How could you possibly say Sonya’s is #1? 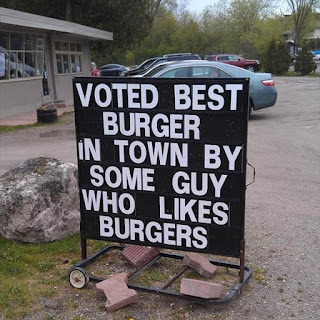 Everyone knows Super Boy's makes the best burger!” repeated about a 100 times with it being obvious to anyone but a moron that burger-X is Winnipeg’s best burger. Of course they're all right – the only person who can tell you what your favourite burger is, is you! 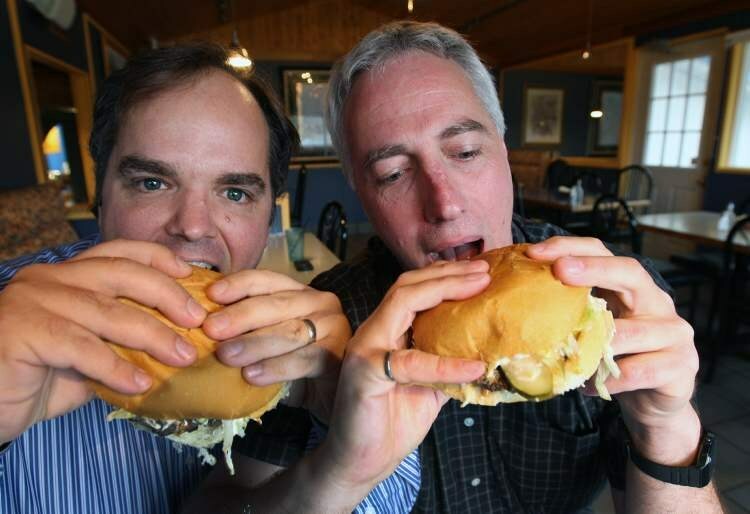 The article singled me out as the author of the blog, but I'm just one of about sixty different voices in Burger Club. Everyone who comes contributes to Burger Club by rating the burger and providing comments that I try and use in the blog. I had my own ideas about who made a good burger and received plenty of recommendations from other burger clubbers and blog readers. We didn't visit every burger joint in Winnipeg and I'm sure there are still a few award winning burgers out there we haven't tried yet. Any of the 4 and 5 star burgers are someone's favourite and Winnipeg is a great place to live if you love burgers! Nobody paid any of us to review burgers, and we've certainly never received a free burger from a restaurant (although Dennis Schwartz from Burgerbend bought us all an ice-cream, but I think that’s just because he's a stand-up guy). The blog is free from sponsorship and I have not (nor will I) monetize it. So many burger reviews are sponsored by a BIZ, tourism agency or with some sort of agenda – I really hoped to provide as unbiased a rating as possible when it comes to something as subjective as opinions about food. Really, we're just a bunch of friends getting together once a week to enjoy each other's company and a burger. None of us have any "credentials" to review a restaurant (although a couple of burger clubbers are quite good cooks in their own right and know their ingredients). Like any other diner, we just know what we like and what we don't. I try and remove some of the subjectively by averaging the reviews over a number of diners. Also by rating individual burger attributes (like flavour, presentation and quality of ingredients) which tends to make the reviewer more analytical. I was trying to compare burgers, not restaurants and prices. We don’t tell restaurants we're reviewing them (they figure it out when we get there) but I do usually give smaller establishments a heads up that there's a large group of us coming so they can be prepared. I didn't at Sandi’s and there was a moment’s panic until they cleared out some space (and patrons) from the VLT lounge so we could all sit together. Sometimes our burger experience might have been better because we were a group, but there were definitely times when it went the other way. Restaurant owners and cooks change too, and as our quest has been going on for over 18 months, we decided to revisit the Top 5 to see if they still were as good as we remembered – but that’s the subject of another blog! Please call John Sadoway at CBC Radio Winnipeg for burger-related story. 204 788 3221.